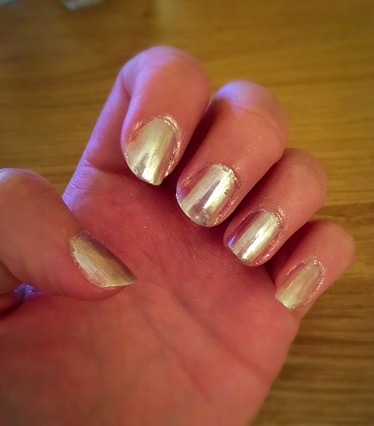 Mirrored nails or chrome nails are fast becoming one of this season’s must have trends so obvs I needed to give it a go! I’ve watched a few vids but thought I’d just try a few things to see what was the best way to do them. 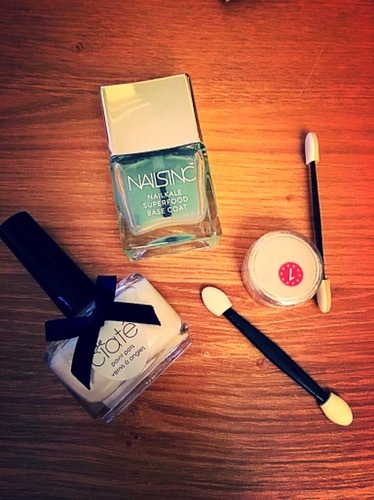 So first up I started with my go-to Nails Inc Nail Kale base coat as I thought the powder would stick to it better. After trying my thumb nail out I then decided to put a pearlescent polish on – Ciate’s Angel Wings as the powder I’ve got is a light one and on top of this pearly white colour came out better! After applying the powder to my nails with the make up brush I got with it, applying it in circular motions until I could see the mirrored effect, I brushed any excess powder around the edge away. I was a bit unsure as to whether I needed to apply s top coat, so using my thumb once again as a Guinea pig I applied my Nails Inc Caviar too coat…u thought it would seal the powder ensuring it wouldn’t sweep off but in reality it took away a bit of the sheen as you can probably see in the image. I bought the pot of powder from eBay for about £7 and am really pleased…it was so easy to apply and I’m hoping it stays on for long enough – we’ll see how they get on after tonight’s clubbercise!